Yeah right, those idiots can shove their french bread up where the sun dont shine....sideways! i still can't get a pic to post on my sidebar. i did what you said.........i saved that pic to my computer...then i went to post a pic, went and copied the code from where it comes up under browse. then i went on the template and pasted it and it didn't work. 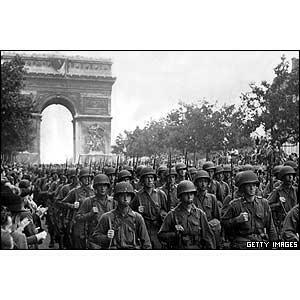 The French are a good example for "giving peace a chance"
You're right they soon forget the sacrifices that the Allies made! Should the date on the post be 1945 though?